Back in 1991 the Commandant of the Otterburn Training Area donated a small silver trophy in the shape of an Otter to recognise the best conservation effort on MOD land. 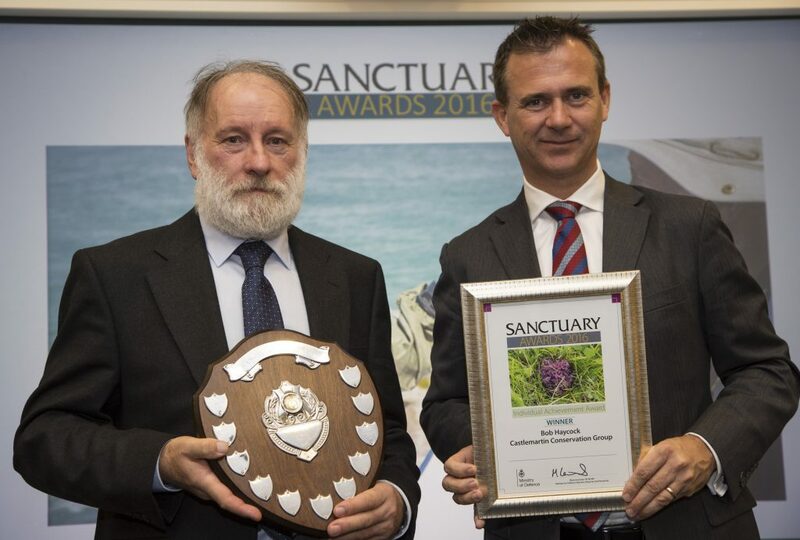 Twenty six years later and the Sanctuary Awards have grown substantially, and are highly coveted in terms of the recognition they bring to conservation work on the defence estate. Hello, my name is Iain Perkins. I’m the editor of Sanctuary magazine and we’re now looking for nominations for this year’s awards. Each year we recognise a diverse range of outstanding environmental work both by individuals and teams. 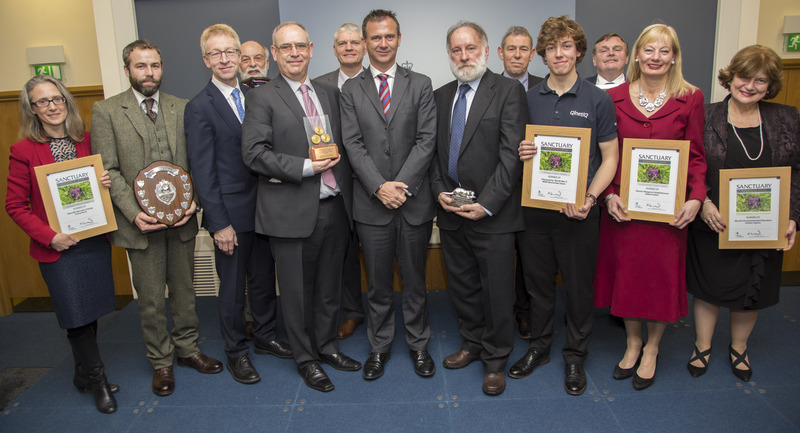 Conservation volunteer Bob Haycock won the best individual achievement award and the Silver Otter in recognition of three decades of effort and success across a range of conservation projects involving MOD sites in South Wales. Another project to win was a group effort to save a 4,000 year old Bronze Age barrow and its treasures. It was facing destruction from burrowing badgers. This project included input from Wessex Archaeology, Landmarc Services along with former service men and women from Op Nightingale. So what are we looking for? In short we’re after projects which showcase initiative, innovation, best practice, dedication, enthusiasm, partnership and ultimately achievement. 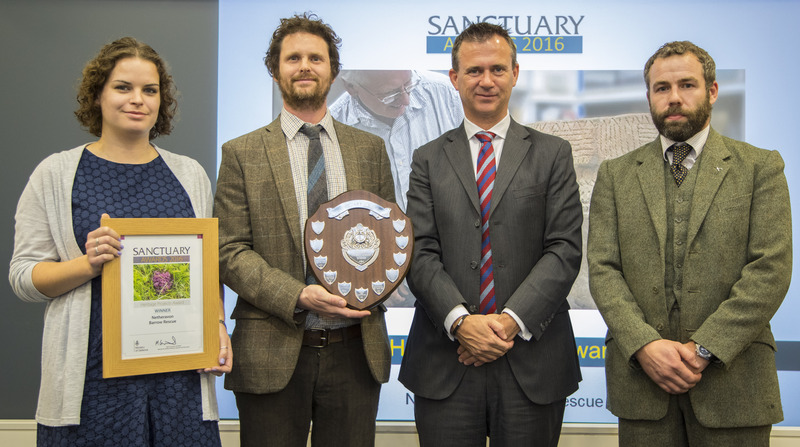 The Sanctuary Awards are open to all MOD personnel, conservation groups, industry partners and environmental stakeholders. They recognise both group and individual efforts shown through projects that benefit the MOD’s sustainable business agenda. All entries must relate to land, property, utilities or equipment which is either owned or used by the MOD in the UK or overseas, or which has a close connection to defence business. Environmental Projects – wildlife, public access, biodiversity, or improving public awareness of these issues. Sustainability – design and building, climate change resilience, defence communities, and procurement projects. Heritage – archaeology, preservation of historic buildings or monuments and historic landscape assessment. Utilities Projects – energy and water consumption, cost reduction activities, projects or technological interventions and behavioural change. Individual Contribution – for those who, in the consideration of the judges have made a significant personal contribution within the areas of Environmental, Sustainability, Heritage and Utilities across the Estate and wider MOD. The winners from each of the five categories will automatically be considered for two further awards, that of the Silver Otter Trophy or the Sustainable Business Award. The Silver Otter Trophy is awarded to Conservation Groups or individuals, MOD personnel or MOD-led projects across the five categories. The Sustainable Business Award will be awarded to projects predominantly led by MOD’s Industry Partners and Contractors. The key thing in your nomination is to capture the essence of the project or task and explain all its benefits and achievements, including its impact on those taking part and the wider community. We also look for good quality images that will illustrate your submission and which can be used by the magazine. Avoid static 'grip and grin' type photos. We want to see the project in action, faces not backs of heads. You can submit a sequence of photos, perhaps before and after images. Award Panels for each of the five categories (Environmental, Sustainability, Heritage, Utilities and Individual Achievement) will be staffed by MOD subject matter experts from the relevant field. They will make recommendations to the MOD Sanctuary Award Board for the Winner and Runner-Up in each of the five categories. The MOD Sanctuary Award Board and external judges will discuss the recommendations and agree which of the Winners will be recognised with the Silver Otter and the Sustainable Business Awards. The judges take a whole range of things into account, and there is lots of extra information about the criteria and the nominations process in the DIN. Nominations open on Wednesday February 22nd and close on 31 March with the awards ceremony due to take place in Main Building, London on the 22nd November. Why not nominate the project you’re working on? Perhaps you’ve entered before but didn’t win – it might be worth a second try? Either way we’re looking forward to hearing from you.